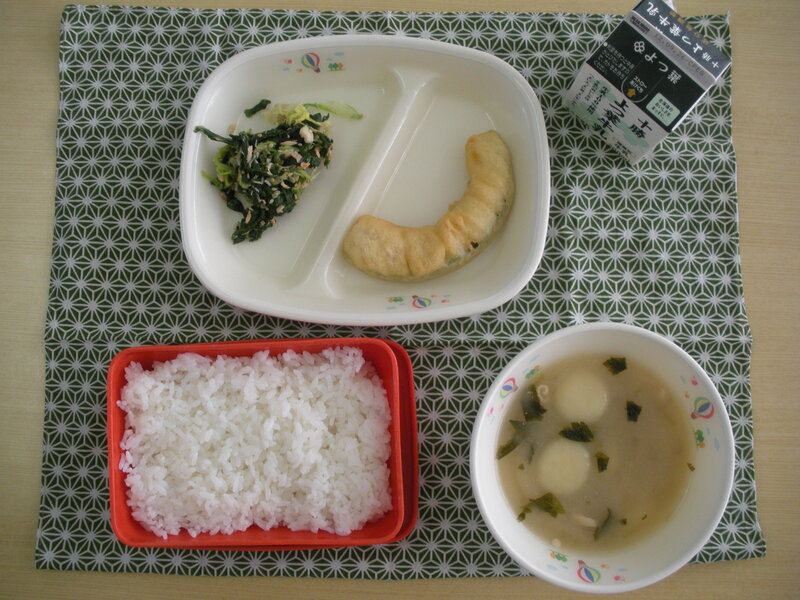 Satsuma Soup is a dish from the Satsuma Province. Satsuma is the old name for Kagoshima Prefecture and it has developed a unique food culture due to the climate and natural disasters. I love the Satsuma Province. It is a great place which has given us so many wonderful things. Not only do the Satsuma Potato (a sweet potato) and Satsuma Orange (a sweet mandarin) come from there, but a lot of sweet people come from there too, including Saigo Takamori of The Last Samurai fame and Ohkubo Toshimichi, who went on the Iwakura Mission. 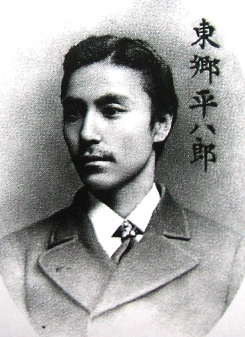 The charming admiral, Togo Heihachiro, is also from Satsuma province. He was really awesome: not only did he run circles around the Chinese and Russians as an admiral, he kept his diary in English, enjoyed British sailor food, made the cover of Time Magazine, and became a God after death. The sesame seeds cooked as a part of the five-ingredient kinpira contain sesame lignan, which works get rid of bad stuff from your body. Chew the sesame well to eat the inner parts of it. 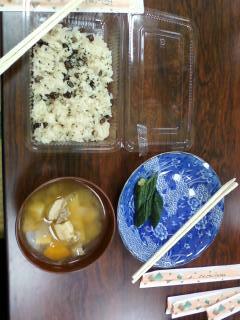 Today’s kinpira contained “tsuto” which is a type of very delicious fish cake. I am not sure you can tell from the picture, but it is white with a red spiral pattern in the centre. It looks quite similar to a more commonly known fishcake called “naruto”. In fact, they look nearly exactly the same. But there is a difference in how they are made: Namely, tsuto is steamed, while naruto is boiled before packaging. So now you know the difference. Beans, which have been eaten from old, are an important food for building our bodies. Last time we had the breaded bean patty, thre were 690 left over. We were surprised because fried patties have a gentle taste. So the Ginger Pork and Veggies literally reads in Japanese “Vegetable’s Ginger Grilled”. You can imagine my disappointment then, when I discovered the dish was a great deal of fatty pork with a couple onions and precisely one small piece of cabbage…. 😦 Yeah, I was really sad. Upon further inquiry, I discovered “Ginger Grilled” implicitly means Ginger Grilled Pork. Well, it can’t be helped. The bean patty fairly flavourless and oily, as expected, and I liked it well enough. I think I am much more sensitive to strong taste than most people, so the gentle taste of the patty was more suited to me. 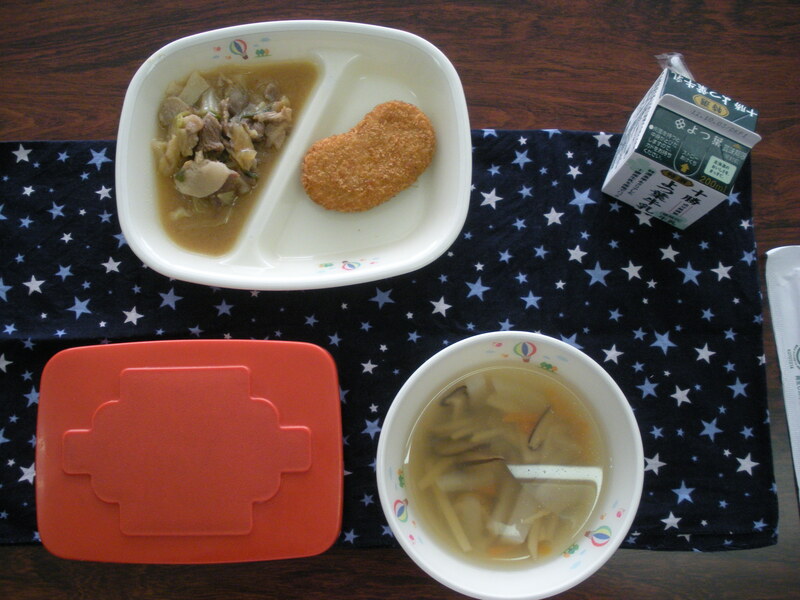 Noppei soup, by the way, had a light nice flavour. 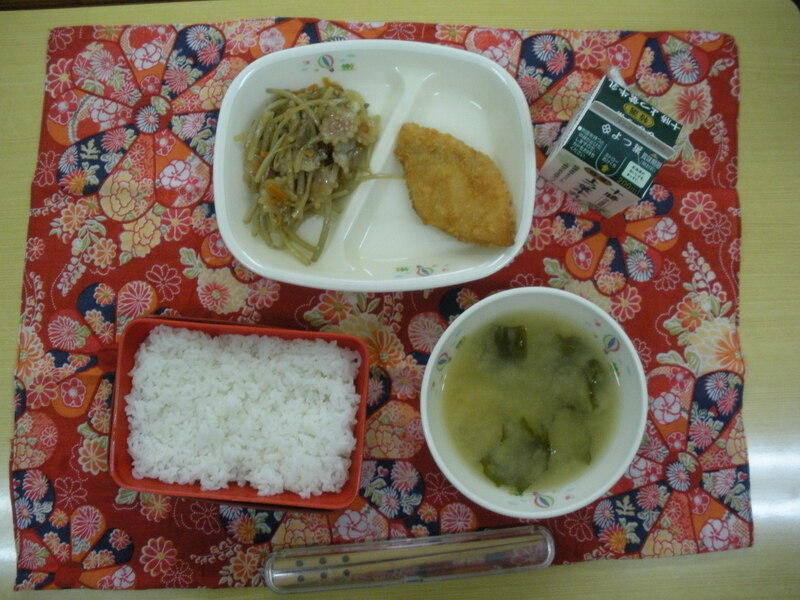 I wouldn’t want to have it everyday, but it was a nice change of pace, especially after yesterday’s heavy curry udon. Contrary to my bilingual dictionary’s defination, the broth was thin and clear and full of taro slices and scallops. Curry Udon makes a comeback! 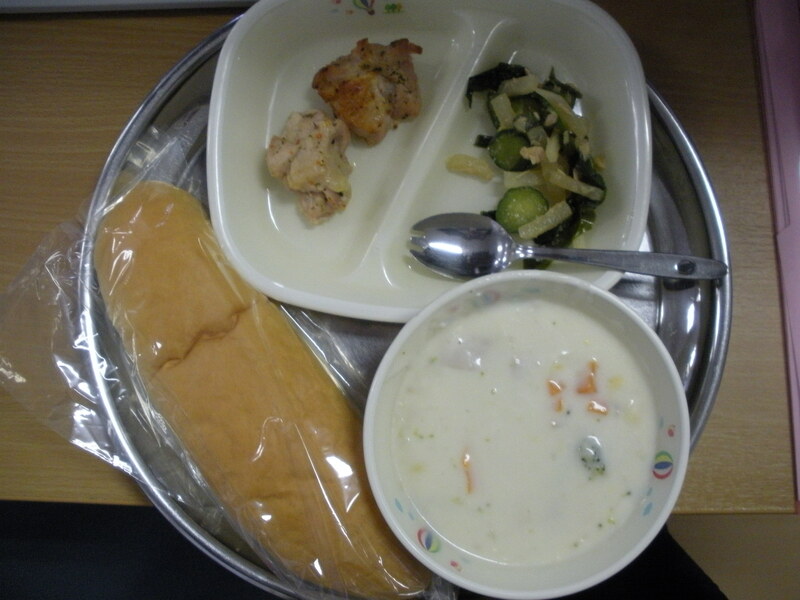 Recently, a lot of curry related cooking is being eaten. 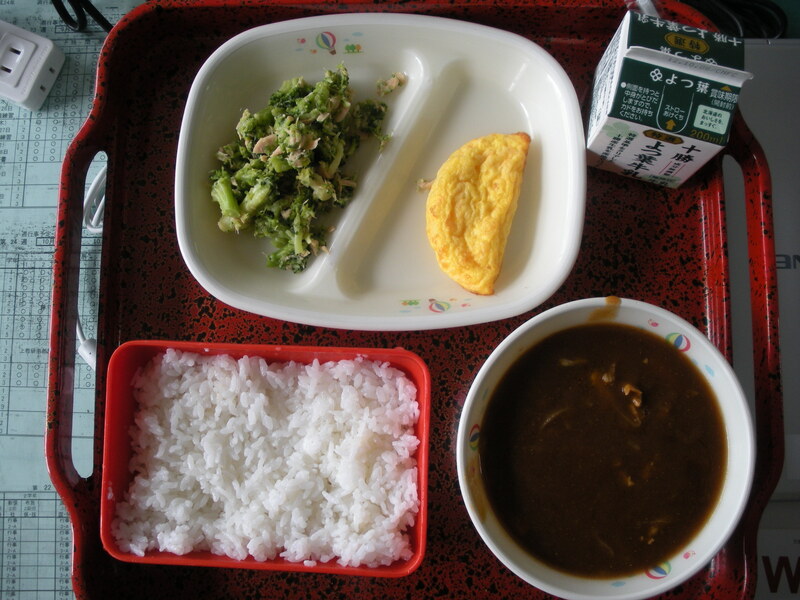 Dishes that the school lunch center previously served are making a comeback. I thought was curry udon was pretty tasty and the second years I ate with agreed with me. However, when I asked my third years about it, they said it was bad. 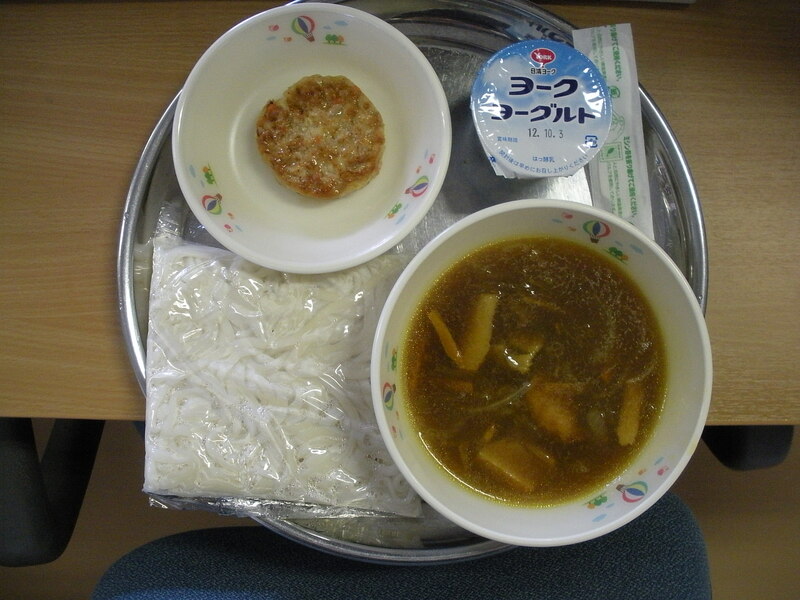 I will say that curry udon is a very dangerous dish to eat. Fortunately I wore a brown coloured shirt today. The vegetable patty had of course vegetables, but seemed to be seafood based: maybe shrimp? I thought it had a nice, light taste. It didn’t match that well with curry though. I hope they serve it on a normal udon day sometime. The yogurt we had today was unflavoured, but still quite popular with my students. As a child, I didn’t much like yogurt. I mean, it was okay, but hardly my favourite. As a child I sometimes got yogurt in my school lunch. It was usually fruit flavoured, but unmixed, meaning the fruit gel was layered on the bottom and you had to mix the firm yogurt to bring the flavouring up into it. That was pretty fun. Now, I try to sometimes eat yogurt at home because its healthy. Also, my favourite TV spy eats yogurt all the time, so I feel inspired to eat it whenever I watch it. Soboro (minced meat) is ground pork, chicken or fish meat boiled and separated into pieces plus a plain or seasoned beaten egg that is scattered and fried in a pan until all the liquid is gone. Again, I didn’t eat kyuushoku today. 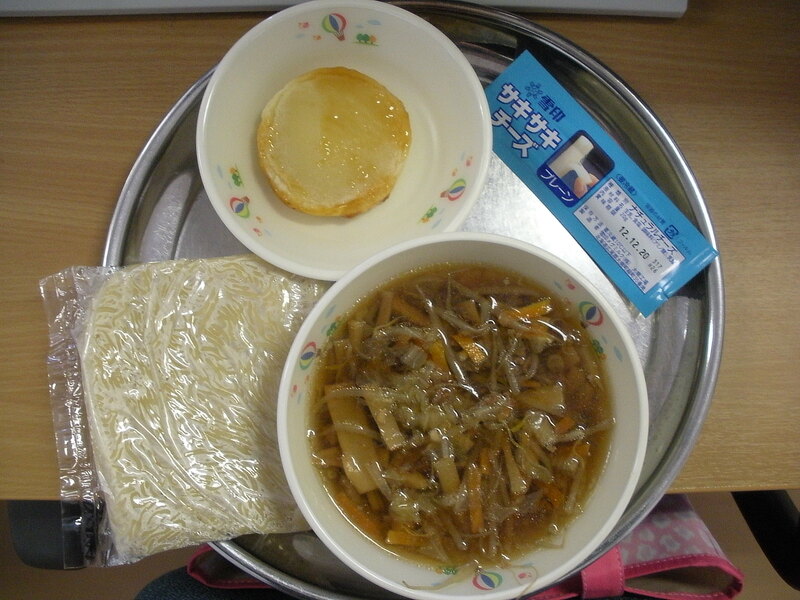 Instead, I boiled up some soba at home and ate that. 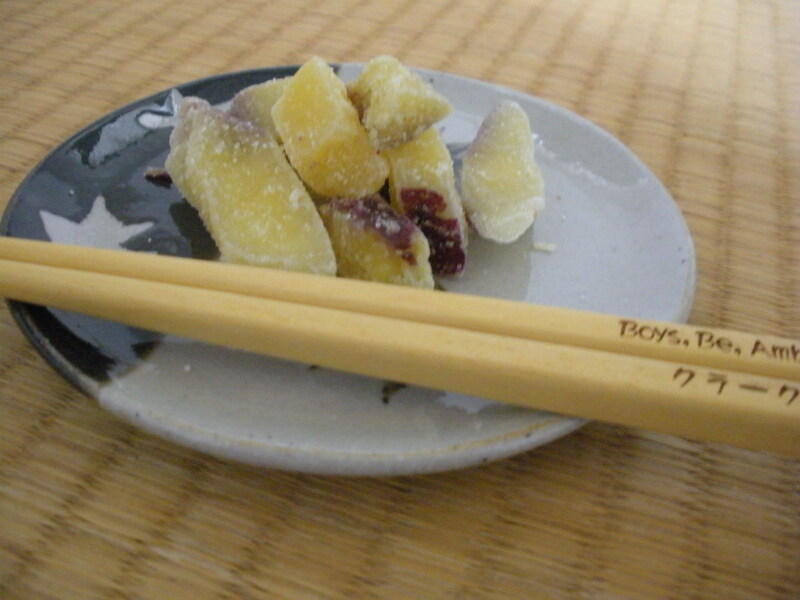 For dessert, I had some very delicious 薩摩芋納豆 (candied and dried sweet potatoes), as pictured above. Note my extremely awesome chopsticks. One says “Boys, Be, Ambitious!” and the other says “クラーク専士” (Prof. Clark) who was a director at the Hokkaido Agricultural College. I bought them at the Sapporo Clock Tower. Prof. Clark’s other famous quote is “Be gentlemen” and Clark himself seemed to follow his own advice. Unfortunately this world is not so kind to gentlemen, and he ended up dying in disgrace. It’s a bit saddening. My school had its school festival this weekend, so in exchange they don’t have any class today. As I didn’t eat school lunch for that reason, I thought I would tell you about the very lovely onaorai I had yesterday at Shibetsu Shrine. The spirit of the deity fills the food offerings that were raised up to Her. 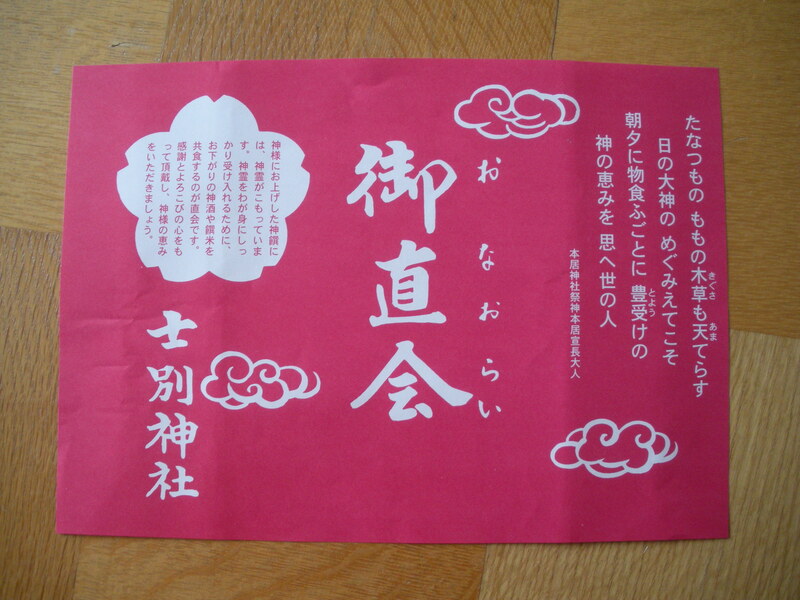 In order to firmly take the holy spirit into ourselves, there is the “onaorai”, where we eat the leftover food and drink together with the deity. Let us receive with a grateful and joyful heart and partake in the bounty of the kamisama. Eating with the gods is a fairly common part of a Shinto, and I think it is very interesting. In (Orthodox) Christianity, we have of course the Eucharist, in which the holy spirit is called down and then the bread and wine is considered the actually body of Christ. And many Christian churches have a “coffee hour” after the service at which everyone shares just normal food and drink. So it seems to me that onaori is a little like a combination of those. Of course, I am not Japanese, so I could be wrong. Either way, it was very nice. During lunch, I sat near a kyudo teacher who complimented my correct handling of the soup bowl with chopsticks, but then scolded me for placing them on my rice container as they are in the picture above. They should be placed on the table, using folded paper as a chopstick rest. I was quite happy that he noticed, and was even more excited when we could share a mutual love for the above mentioned Motowori Norinaga.